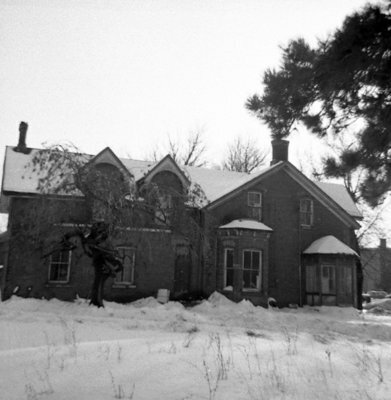 A black and white photograph of the residence of George Cormack in winter. View is of the north side of the house. This house was located at 319 Green Street in Whitby. This home was built in 1861 at the south east corner of Green and Dunlop Streets. It was demolished in July 1964. George Cormack was a Whitby lumber dealer. Residence of George Cormack, January 1964, Brian Winter. Whitby Archives A2013_004_181.